It’s fair to say that, irrespective or which side of the Brexit vote you supported, there’s been some lamentable post outcome librettos sparked by ‘leave’ campaign leaders. And, if all that wasn’t enough, how about the former Ukip front-man’s first post-Brexit speech to the European Parliament? Wow. Whatever your take on the politics, it’s indisputable that many political figures have publicly put their ‘foot in their mouths’, so to speak, in the aftermath of the Brexit result. Yesterday, we posted a blog that used location analytics and data visualization to compare the geographic spread of Brexit ‘leave’ voters with the incidents of Mad Cow Disease recorded during the UK’s 1992 outbreak. 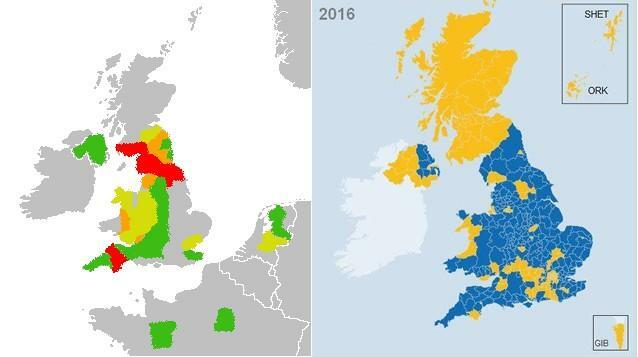 Whilst the correlation was identical, it turned out to be too good to be true, with the two maps having been doctored by a mischievous Facebook user. Knowing this before writing the article, we then proceeded to discuss the need for Collaborative Business Intelligence to play a strong role in avoiding such embarrassments by connecting data with other contextual information. But, perhaps we’ve all been too preoccupied with this now infamous hoax to search for other potential parallels. Maybe, just maybe, all these figurative feet in mouths have been pointing towards the real truth. 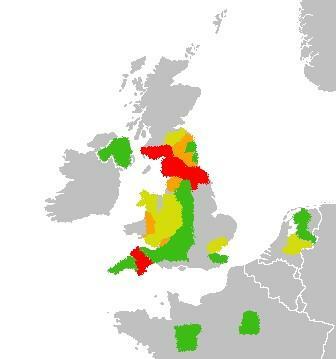 The above map plots the 2001 outbreak of Foot and Mouth Disease in the UK. And, put alongside a map displaying the location of Brexit leave voters, there are some striking similarities. Now, we’re not saying that this the best use of Business Intelligence software. But, it might just indicate a hidden talent that Britain’s leave campaigners have for transforming the literal into the metaphorical.